One Week Only! Get Free Mystery Gift with every order. Boxking Week Sale! Get 15% off everything. Get 20% off G1 Slide Board Package. Get 16% Off All Orders. Get $15 off HS Goal & 2D Backstop Combo. Cup Sale! Save 17% on all products. Save $25 on Allstar Training Packages. 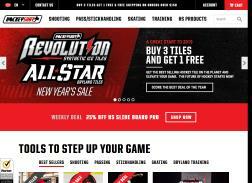 Get 10% off all Hockey Training products.